This entry was posted in Fun Stuff on May 21, 2016 by Steve Tilford. Yesterday morning, Bill and I headed over to Lawrence to our annual school visit at Woodlawn Elementary School. Matt Gilhousen, founder and owner of our sponsor, TradeWind Energy, has done arranged this the past three years. Matt lives in North Lawrence and is very supportive of his neighborhood. We’ve given the all the kids helmets and lights before. 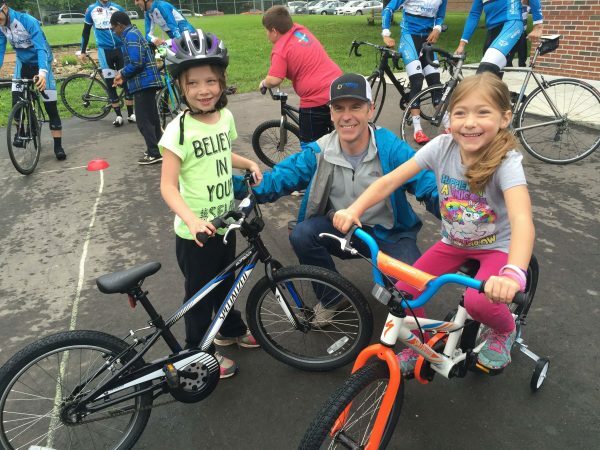 This year, Matt bought 21 bikes Specialized children bikes for kids that didn’t have them. Pretty cool. One kid asked about how much our bike cost. It is nearly embarrassing for me to delve into that subject with the adults, teachers and parents there. Telling these kids that our bikes would cost over 10K doesn’t sit well with me. I backtracked and said that you could get a bike to compete for less than $1000, which still seemed outrageous when talking to a bunch of elementary school kids. Maybe I’m just out of touch with costs. This year some of the parents made a little obstacle course. It was pretty challenging. The rain held off, but everything was wet. The obstacle course had some plywood teeter-totters, which seemed sketchy, but the kids weren’t fazed. It was a good change of pace. Tucker came and I took him for a little run in the neighborhood. He was super excited and took off. When we went by Matt’s house, he did a 90 degree turn and ran to his back porch. He’d been there once, for a party, when he was 9 weeks old. I don’t get how he remembered that. He went there in an automobile and never wandered around his lawn. Dogs. I’m going to pack up and head west to Lake Wilson , which is in Central Kansas. It is a little over 2 hours away. I’m hoping not to get too spooked pre-riding tomorrow’s MTB race course. It is super technical in a few places. I am probably going to just get off and walk the technical sections. Not that I’m that scared, it will just be faster doing it that way. More predictable. It just depends how the race is going deciding when to walk and when to try to ride. It has been in the 60’s here, and tomorrow it is supposed to be in the mid 80’s and windy. It could be worse, but racing off-road is always much hotter than on the road. I don’t think anyone is used to those temperatures, so it shouldn’t change the results much. Okay, once again, I need to get going to pack. The guys talking to the kids. Matt with a couple of the kids that got new bikes. Tucker was beat after his full day. You don’t give a bike away…you give freedom, confidence, adventure, joy, and sometimes crashes….just like real life!! It is a terrific thing to give away a great life tool! Great work!! Group ride this week and we stopped at a convenience store to top off the bottles. A guy in his 20’s approached me and he asked me how much my bike cost. He is dressed like he is a landscaper or does construction and his English was good but his second language. You realize he is one of the guys you see on a cheap Wal Mart mtn bike commuting to his job; be it early morning outdoor work or late at night coming home after working in a kitchen. Puts it all in perspective how lucky we are to be given the opportunities we have. The smiles of those kids say everything! Throw the question back on the kids so they’re parents hear it nice and clear: a 10k bike is way cheaper than a kid that needs coddling for at least 18 years. I could have bought 40 bikes by now. 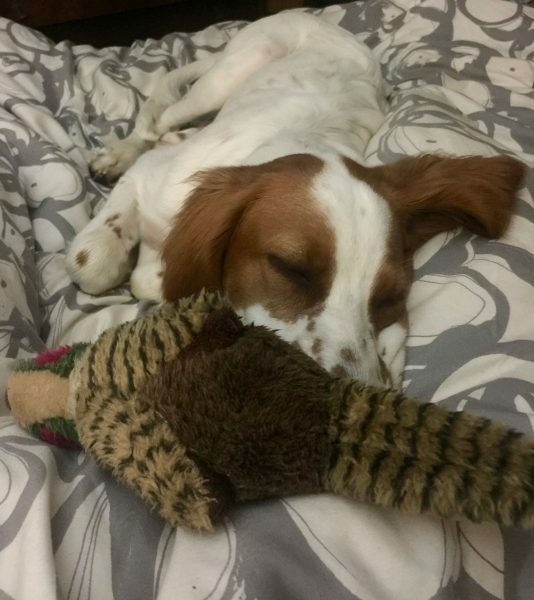 Tucker all tuckered out again. Just like dad sometimes. Might be tough for you to do Steve; what’s good for the goose is good for the gander??? that team owner of yours is a cool guy spending his $$$$$ like that.. not too many guys like that left around..and i agree with the above post.. as many times as you crash, you need to wear your helmet …. all the time! !you’re a grown man andcan make your own dicisions, but ONE fall is all it takes.. then what? who gets tucker?? Justifying a rididiculous price tag with a $1000 price point is embarassing, god forbid the best athlete win, but then again isnt that what 87.4% bank on? Well done Steve. You, me, and kids love bikes. Chapeau! Sponsors like Matt and Tradewind are priceless! The kids must have been so happy. Tucker is Spuds Mackenzie, Party Animal. Wanted to go back and party like he was 9 weeks old! Steve, I know you wrote you felt that even saying $1000 for a bike seems outrageous. But hearing the kids I coach, it really wouldn’t faze them like you and I think it should. I guarantee you they are comparing it to the cost of a video game system like Xbox or Playstation, which can easily run $400 (which does not include the cost of the popular games) or one of those hoverboards, or both. That puts a $1000 bike in the same realm. It was really weird last year before the big Mayweather/Pacquiao boxing match to hear 12 year old kids talking smack about boxers’ net worth. Does Tucker wear a helmet? BTW, referring to the picture above, does Tucker often fall a sleep with crap in his mouth?